When I was a kid, I wanted to be a marine biologist. I had visions of living on the coast and working with dolphins. When it came time to choose a college, however, I stayed close to home (which is landlocked). But I still selected biology as my major. The thing about biology is that it requires a lot of math and chemistry – two of my least favorite subjects. By my sophomore year, I had suffered through an entire year of calculus and basic chemistry and was now entering the dreaded world organic chemistry. My life became wrapped up in chemical equations, mind-draining math problems, and a lot of crying out of pure frustration. At one point, I was able to pull a bottle of cleaning solution from under the kitchen sink and draw the chemical structure for each ingredient listed. It was a cool trick to impress my friends, but it didn’t make me enjoy the class any more. As if sitting in a lecture hall with 300 other students three times a week listening to a professor drone on in a seemingly foreign language wasn’t bad enough, we also had to endure a 4-hour organic chemistry lab once a week. It was a complete nightmare. I hated that lab so much that I would actually get sick to my stomach and start to shake hours before I had to go. In the lab, we used something called a sand bath to indirectly warm up test tubes. I would just stare at the little pile of sand and dream that I was on Pensacola Beach in Florida where we used to vacation every summer when I was a kid. Being able to transport myself to my “happy place” during that lab was the only thing that got me through it. At the end of sophomore year, I admitted to myself that biology was not the right major and, after much consideration, I switched to Writing Intensive English with a minor in Fine Arts. I still played around with chemicals, only it was in a photography lab and I got to witness the magic of watching my pictures come to life. It was 100% more rewarding than anything I ever experienced in the organic chemistry lab. I’ll never forget when I was going over my graduation requirements with my advisor senior year and he pointed out that I only needed to take one more chemistry class and then I’d have a chemistry minor as well. I just laughed. There was no way I was ever going to do anything with chemistry ever again in my entire life. 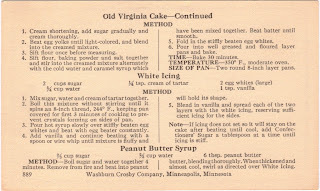 This week we celebrated another birthday in my poetry group and the cake chosen was an Old Virginia Cake. It’s basically a Burnt Sugar Cake with a Boiled Icing. 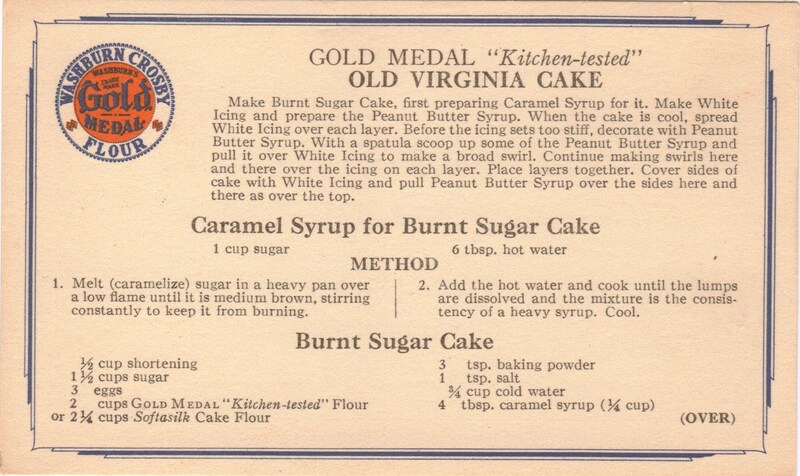 The first step is to make a caramel sauce by heating sugar (by itself) in a pan until it turns into a brown paste. Then you add six tablespoons of water. As I stood over the stove stirring the sugar around waiting for some sign of change, I was reminded of the beautiful white beaches at Pensacola Beach. Even though the weather is starting to get nice in Minnesota, I desperately want to return to Pensacola because that’s where my grandmother lives. Just as I was starting to feel the warm fuzzies from being in my “happy place,” I noticed that the sugar had started to brown. My excitement from watching the white crystals break down into brown syrup evaporated when I got a twinge in the pit of my stomach as I started to have flashbacks of organic chemistry. “But this is cooking,” I thought, “this is nothing like that, this is fun!” Yeah, that thought lasted approximately 20 minutes. After the caramel syrup was done, the recipe instructed to let it cool. So I mixed the rest of the batter and then ate lunch. By the time I got back to the syrup, it was like a solid chunk of amber petrified into the pot. I expected to see a mosquito frozen into it waiting for someone to extract the million-year old DNA and bring dinosaurs back to life. I attempted to add heat in order to return it to its previous runny state, but the amber block just wouldn’t cooperate. I threw it away and started over. This time, however, I don’t think I let the sugar boil long enough before adding the water because it instantly clumped up and was irreversibly ruined. At this point, I began to get really frustrated. I just wasted two cups of sugar and had to start over. Again. Deep breath. Third time’s the charm. Right? Sort of. The caramel sauce was successful and I didn’t let it cool too long, but the next step is to stir ¼ cup of sauce together with ¾ cup of cold water. Immediately upon touching the water, the sauce would harden into a cloudy orange ball. I had enough sauce to try it twice, and it was the same turnout both times. Now I was getting upset. I had a Julie Powell moment where I threw the kitchen towel into the sink and sat on the floor crying (if you haven’t read her book Julie & Julia, go get it right now. I promise you’ll love it! 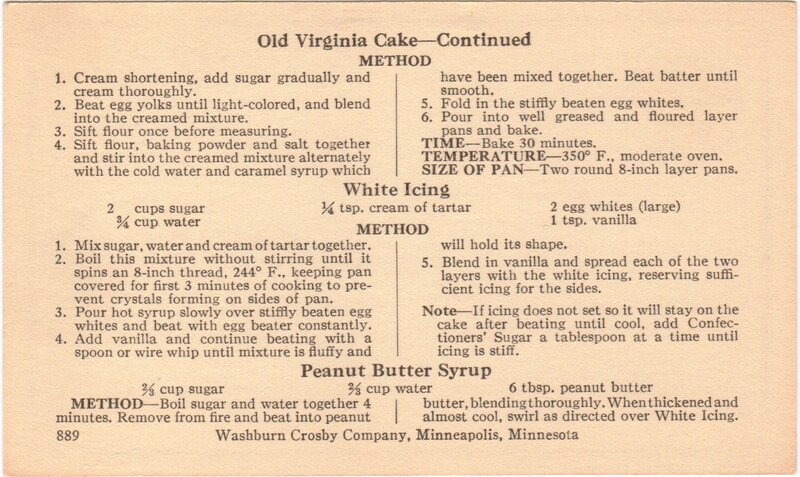 I actually have two recipes in the box I am dedicating to her, but more on that later…). It hadn’t been a good day before I started the cake (car problems triggered a bad mood early on) and this wasn’t helping. 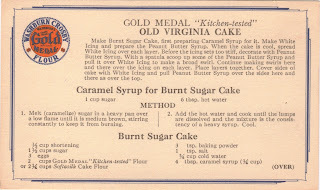 I pulled myself together then headed to the computer to search for videos on how to accomplish making a Burnt Sugar Cake. Unfortunately, most of the recipes were different than the one I was using and weren’t helpful. However, by the time I got back into the kitchen, something amazing had happened: one of the clumpy orange masses had almost completely dissolved in the water. I was shocked. Maybe I had given up too soon, maybe I had let all those pent up feelings of hatred towards organic chemistry overcome me and I deemed the cake a failure before I even gave it a chance to work. So I dried my tears, poured the mixture into the rest of the batter and finished making the cake. The next step to tackle was the dreaded boiled icing. Thankfully, I had dinner plans with friends that night and couldn’t get to it. Instead, I woke up early Thursday morning and, while Murphy was still tucked in bed (he doesn’t get up until at least 8:00am now, unemployment has made him very lazy) I took on the challenge of icing the cake. I think my guardian angel was making up for the mess of the previous day because for the first time ever, the boiled icing was a complete success. It was so successful, in fact, that it actually felt easy. I cried again, but those were tears of extreme joy (and relief that I wasn’t going to waste a few more cups of sugar). I don’t like giving up on things. I was so frustrated making this cake that I almost let my swelling emotions convince me that I couldn’t do it, that I should just give up, post the card to the site and apologize for not having a photo of a cake. I’m really glad I didn’t quit because this is a pretty decent cake (to eat, not to make). But sometimes, we also need to admit to ourselves when something we’re doing isn’t a good match for us and just because we can do it (however painful it is to endure), doesn’t mean we should. The day I officially changed my major, I saw my dreams of being a marine biologist drift away from me. I was crushed and felt like a quitter. Even though I was infinitely happier writing and working in the photography lab, I still felt like I let myself down. But several years ago, I finally got a chance to live my dream. 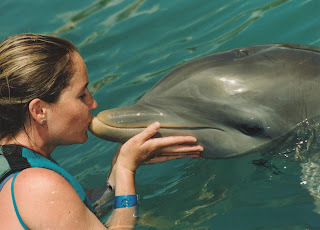 I swam with the dolphins while on vacation in Mexico. It was the most amazing experience of my life and I hope I get to do it again someday. As I dropped down into the water and ran my hand over the dolphin’s smooth skin, my heart pumped with exhilaration. I wondered what my life would have been like had I chosen to go to school on the coast and study these magnificent creatures. Would I have actually enjoyed organic chemistry or would I still have chosen my creative side over chemicals and math? I think I was always meant to be a writer. From the time I was little, it has always had a presence in my life – I still have sketches of comics I made as a kid and short stories I wrote in grade school. And that day in the pool with the dolphins, I was happy that I had chosen writing and art. Because at that moment, I was absorbed in every detail of the experience, wrote about it in my journal, and kept the pictures in my scrapbook rather than looking at the dolphin analytically, measuring his every move and calculating each aspect of his being. And I’ve had the same experience in the kitchen as well. I recognize that chemistry is wrapped up in every element of what I’m doing, but I choose to see the art in it instead. How the light, airy whip of an egg white meringue looks like a poofy summer cloud and the sheen of a perfect boiled icing reflects the sun the same way the Gulf of Mexico does on a sunny afternoon. Although I hated organic chemistry, I don’t view that year of classes as wasted time. Someone told me this week that we can’t look at setbacks we have in life as failures, but instead as opportunities to learn. This year past year has been full of those opportunities. And each one has led me back to writing – especially the ones that involve catastrophes in the kitchen. I’ve learned the most from the recipes that have given me trouble and during each one, I’m already writing the post in my head as I cuss out the mess on the counter in front of me. Organic chemistry forced me to look deep inside myself and discover who I really wanted to be. So has unemployment. So has cooking. And to each of those, I am eternally grateful. And who knows, maybe someday I’ll still get a chance to live on the coast and work with dolphins. Only, this time, my dream isn’t to be a marine biologist, but to write about these magnificent creatures and share my love for them through words and images rather than mathematical calculations. And when I finally write a book, I’ll be sure to thank organic chemistry for helping to lead me down the path to realizing who I was truly meant to be. Tastes even better than it looks. Thanks, Molly. Wow, what a fabulous story. You have so many levels going on here, Molly. Your writing is REALLY good. Also, that photo of you kissing the dolphin is totally amazing!